Film school is an opportunity to sharpen your creative skills and become immersed in your craft. It’s a space to learn the principles and basics of movie making while searching to find your own original voice. As an aspiring filmmaker, being surrounded by your classmates will expose you to countless genres, personalities and styles. However, with thousands of film schools around the globe, it’s important you pick the right one. It’s important to take an audit of your specific needs before you commit to a particular school. Here are seven key factors to take into account as you shop around for an education in film. An obvious start to choosing a school is finding a place you wouldn’t mind living but there are other less apparent things to consider as it pertains to film. Search for the top film schools in a location that will provide plenty of interesting things to shoot and expand your cultural comfort zone. If you attend school in a rural area, you could end up being limited on the style of your shooting locations and the availability of paid opportunities. Or vice versa, if you’ve been living in a big city, you may benefit from exploring something more remote. Having access to diverse scenery and a lively atmosphere will make life easier for capturing unique and original content. Another area to examine when researching locations is the local job market. Find a film school that is close to the companies or industries you would want to work in. For entertainment, this is LA, for advertising it’s NYC, and for technology, it’s San Francisco or Austin. Of course, these are generalities but you get the point. This will the open door to making valuable contacts in your desired niche. It could also save you the trouble of needing to move again after graduation. Aim to find locations where you can eventually launch a career. Ideally, you want to attend school in a place with a good economy. Life is unpredictable and living somewhere prosperous will keep you covered in the event that you need to drop out, or if the job market goes south. Figure out who is teaching the classes at your target school. The educators you are paying to learn from should be experienced video experts with proven credentials. Research their previous work and education to get a better idea of their accomplishments. Look for programs that occasionally bring in big name professionals as visiting professors or guest speakers. Lessons from established industry leaders offer a valuable real-world educational experience. Visiting professors can be a great resource but above all else, you should confirm that the school has a permanent staff of engaged teachers. You want to learn from skilled people who are happy to serve as mentors throughout the development of your skills. Studying under people who are are dedicated film lovers will introduce you to new ways of seeing things. The greatest professors are ones who offer actionable technique, sound theory, and new inspiration. Use sites such as Linkedin or RateMyProfessor to learn more about the faculty. There are dozens of review sites and databases ranking the quality of teachers and overall programs. Take a look at the senior projects soon-to-be graduates are posting on Youtube. If you are already producing higher level work than this you should reconsider going to school in the first place. Reviewing senior projects will demonstrate an approximate culmination of a student’s education. It will also reveal the standards by which teachers are grading assignments. Compare the curriculum with the knowledge demonstrated by the graduates. Ask yourself whether or not the school’s “intensive hands-on program” is paying off as advertised. Once you have researched their work try reaching out to former students on via email or social media. Ask them if they are willing to share thoughts on their experience. Alongside an in-person tour, this is often the best way to establish what attending a school will be like. Use this as an opportunity to get the inside scoop on things beyond education such as parking, food, and campus culture. Speaking to graduates can save you time and help set expectations. Make sure the school you plan to enroll in is entirely devoted to film and video. You should avoid studying film at general colleges that often have small and understaffed video programs. 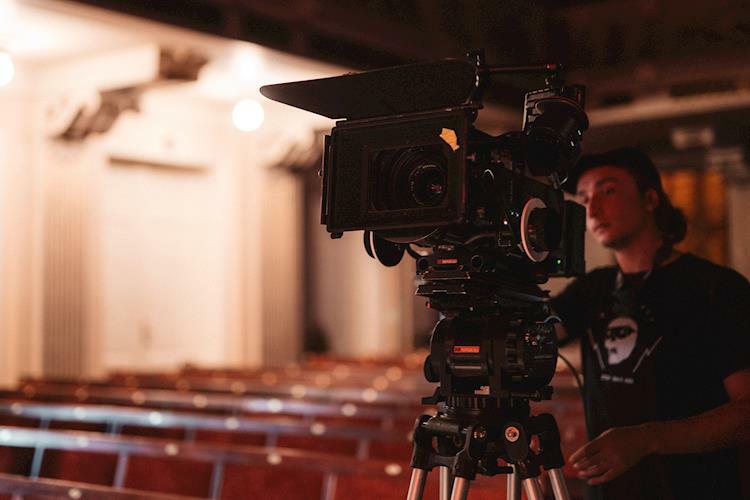 Full-fledged film schools will typically provide you with more resources, higher quality teachers, and in-depth programs. Attending a school with an extra number of specialized courses can be critical for roles with high learning curves such as directors or sound technicians. On the other hand, if you’re more interested in taking on a corporate role, traditional Universities are a great place to develop complementary skills. Advertising or PR degrees will prepare you for work in production companies, talent agencies, and film studios. Gaining these skills can serve as a backup plan in the event that you no longer wish to pursue a career in entertainment. Regardless of the school, you want to find an establishment that will allow your personal development to run parallel with the curriculum. It’s unlikely that your film school will fully specialize in a particular genre or style of film you are passionate about. Create your own personal learning plan that factors in your tastes or topics your education hasn’t covered. Developing your skills around other talented filmmakers will naturally push you to be better. For this reason, it’s a good idea to prioritize schools that demonstrate active involvement in the local film scene. Make a note of how many film-related clubs or organizations are available on campus. Search for screenings and film festivals that take place within close proximity to the school. An area with a culture of watching and creating films will turn your major into a lifestyle. Remember that there is great value in the network you gain during college. As your fellow graduates go on to further their careers, you should check in and maintain a good relationship. Look into the alumni who have graduated from the film schools you are researching. Taking part in your student community early will let you tap into a similar established network down the road. Studying film at a college that doesn’t have the latest in filmmaking equipment will make it much harder to transition into the industry. Find out what equipment the students are using and, if possible, the condition you will find it in. Many schools offer equipment and studio information online. Don’t be fooled by schools that advertise top of the line equipment but limit student access to several weeks per year. Ask questions or make a trip to see the facilities yourself. Equipment is a vital part of your film education. Learn the rules for checking things out and do your part to keep them in good condition. Get hands-on experience in the field using different cameras, lenses, audio and grip equipment. When you graduate you will no longer have access to this vault of tools, therefore you should make the most of the opportunity to learn with them. One of the more stressful aspects of your film school hunt will be the reality of cost. The price of universities has trended upwards in recent decades and earning a degree in film can easily cost up to $100,000 or more. Film schools in particular need to cover the costs of equipment and facilities intended to simulate professional production environments. Additionally, the status of a school as a public or private institution will also play a role in the price you pay to attend. You can do your best to alleviate these costs by acquiring financial aid or scholarship options. Overall, you will need to ask yourself whether the price you are paying is worth the education you are gaining in return. Keep your search limited to colleges that offer real-world experience and high-quality staff or tools. If you’re beginning to realize that film school might be out of your means, don’t let that be a reason to set aside your dreams. The internet has made it possible to access a plethora of free or affordable film expertise. Start exploring your options online and gain first-hand knowledge through mentors or by doing free practice projects. The path to becoming a filmmaker is riddled with challenges. Finding a film school that best fits your needs is just another hurdle on that list. The right institution will equip you for a rewarding career but ultimately it is your commitment to film that will determine how far you go.